This is the one that had five plastic markers in the seams. I took out the stitches, and released the plastic, then sewed the seams over. It worked out well, and I am going to be much more careful next time I use them. All batiks. 54 x 66. I will have this done by a pro. It's so much quicker. Very pretty, great color placement. Looks great! We haven't had power for much of the day... love to see your colourful work when I managed to get on here. Really good color placement for this pattern. Can't wait to see it quilted and finished. Great pattern and colors! I can picture it quilted with a woven design showing off the piecing, but I'm sure it will look gorgeous however you decide to quilt it. Please show it again when it is finished. 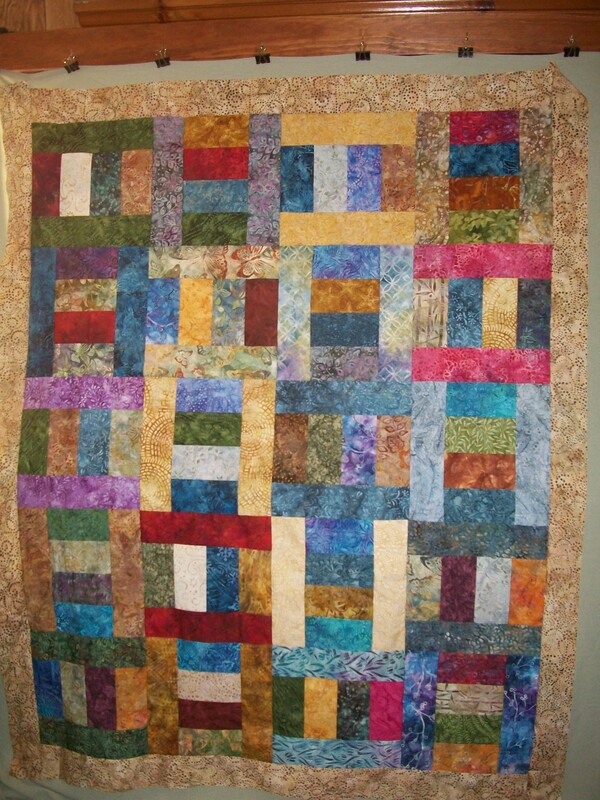 Such a pretty quilt and love all of your batiks. Great pattern to show off you beautiful fabrics. Colorful and such a good name for it. Yes, sending it out helps get it done more quickly! It also keeps me away from the chiropractor! Well worth taking out the pieces. Nice quilt. A nice easy quilt. I could cut up lots of my scraps and make this. What fun! I really like yours. Such beautiful colors ! Is that the name of the pattern? It's beautiful in batiks. It resembles a quilt I made for our bed, but I didn't use batiks. HobbyKat1955, plastic markers are to pin on each block so you know where you want it in the quilt. They say Row 1 Block 4 etc. It's a handy system, but I must remind myself to pin in the center of the block. DJ, I just named it that. I saw a picture online and fell in love. I drew it up in my EQ5 and then went to work. This is the second one I've made in this pattern. The first I named "Nothing Contained". Good work on the quilt top. I look forward to seeing it quilted.